Shhh! Don’t tell my kids! As soon as my kids were done with breakfast today, they were begging to go outside and use their new shovels on the snow we’re getting. We need a little work on technique, but they kept at it for quite a while and were having fun. 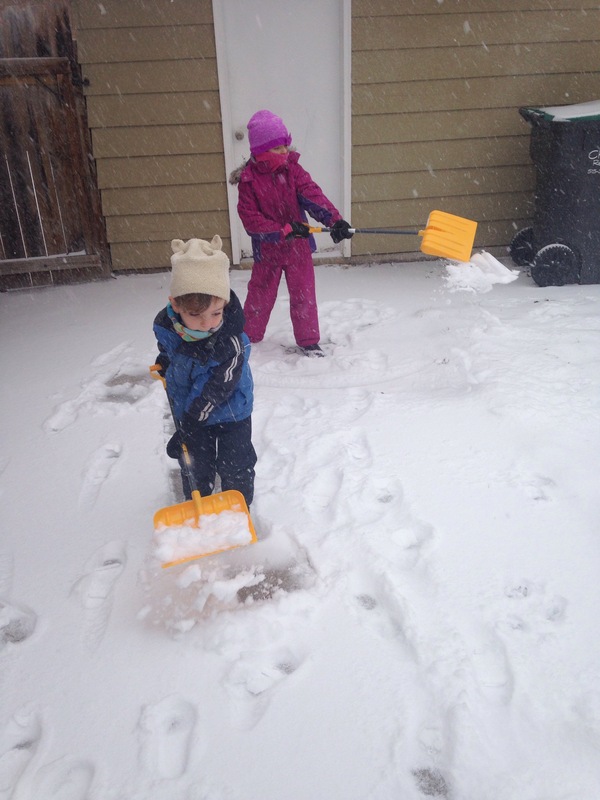 So, please, don’t tell my kids that shoveling is a chore most people prefer not to do! After we got back inside, C asked to do school stations. D was totally on board. The kids spent about 10 minutes per station, doing spelling/drawing, creative writing/coloring and Think-it-Through tiles. So, please, don’t tell my kids that it’s winter break and they’re not supposed to be doing schoolwork! For Christmas, C got some new fuzzy lined boots and D got a new bike helmet from us. They also each got a new book and a sled from us and they each picked out a toy for the other. Today is the 4th day since Christmas and the 4th day that C has worn her boots all day long. D has been out riding his bike in the cold, because he wanted to use his new helmet. They are in love with their fairly ordinary presents. So, please, don’t tell my kids that some kids get lots of fancy, expensive presents! Often times, when I’m emptying the dishwasher or folding clothes, one or both kids will ask to help. When Daddy is cooking, more often than not, a kid will ask to help. I’m not sure if they want to help because they truly enjoy the chore, or because they like to be helpers to mom and dad, but they ask to help and are improving each time they do. At 6 and 4, they don’t receive an allowance, so their motivation isn’t monetary 😉 So, please, don’t tell my kids that stereotypes suggest that they whine every time they’re asked to do a chore! When we visit Daddy at work for lunch, and have a big, delicious buffet full of foods to choose from, the first thing D always goes for is a spinach salad with craisins. His other salad toppings and food choices vary, but that is a constant. At the same amazing buffet, C always has a slice of pizza and then tries something new – rock shrimp with squid ink pasta, a bison burger or miso salmon – just to name a few examples. And she usually likes them. (Now I’m guilty of this one, because I used to be a super picky eater and am still hesitant to try new things sometimes, so this reminder [well, really all of them] is totally for me as well.) So, please, just because my kids are young, don’t assume they won’t want to try new things or eat a variety of healthy foods! I am certain I’m making my share of mistakes along the way, but I’m trying to raise loving, responsible and tolerant children. That’s the big picture. I think it’s the every day, little things, that will shape them the most. So I need to remember, and I need others in their lives to remember, that my kids are their own people. They are not the kids who have come before them, or the kids who will come after them. My point of all this, is that if people act like it’s the craziest thing in the world that my son likes spinach or are shocked when we’ve done schoolwork outside the hours of “normal school,” it will have an effect on my children. If people act like it’s weird that they like to shovel or empty the dishwasher, they might start to believe that too. However, I don’t think we’ll ever have magic chore fairies, so they need to know how to and not hate doing these things. And I don’t want my kids to change. These very things are what make my children the amazing little people that they are. So, please, love my children for who they are and don’t try to change them! Bwahahaha! There are probably homeschooling parents who have a schedule. And it might become more necessary as my kids get older, but right now, we have no such thing. Which is one of my favorite things about homeschooling! Here are some examples of what our days have looked like the last few weeks. On Daddy’s birthday, we had a cake to frost and plans to take the cake and ice cream in to share with the team at work. Not wanting to miss out on anything, CMonster was high on motivation that day. All our school work was done by 10:30. That same week, we had some beautiful days with abundant sunshine and above average temperatures. As a winter-hater, I wasn’t about to stay inside on a beautiful December day. On one such day, we walked around Ada Hayden, met friends for lunch and went to the Meeker playground. We were finishing up our last lesson right before I started on dinner. We took a few days last week to visit some good friends in the Kansas City area. With a 4 hour drive each way, we had plenty of time to get some schoolwork done in the car on driving days. CMonster read out loud to her brother, did math worksheets, Draw Write Now (which is a drawing lesson and copywork) and some language arts lessons. I had her work for each day in a folder, with instructions written on post-it notes when necessary. She loved being in charge of her lessons, so I might have to try to work a self-directed day in every week – even if we’re not traveling! The kids also listened to two of the Boxcar Children books on CD and watched some Magic School Bus while we were in the car. On our full day visiting friends – who also homeschool – CMonster completed a math, reading and history lesson by about 9:30. Then we went to the zoo where she learned all kinds of fun facts from the signs and the friendly tram driver. 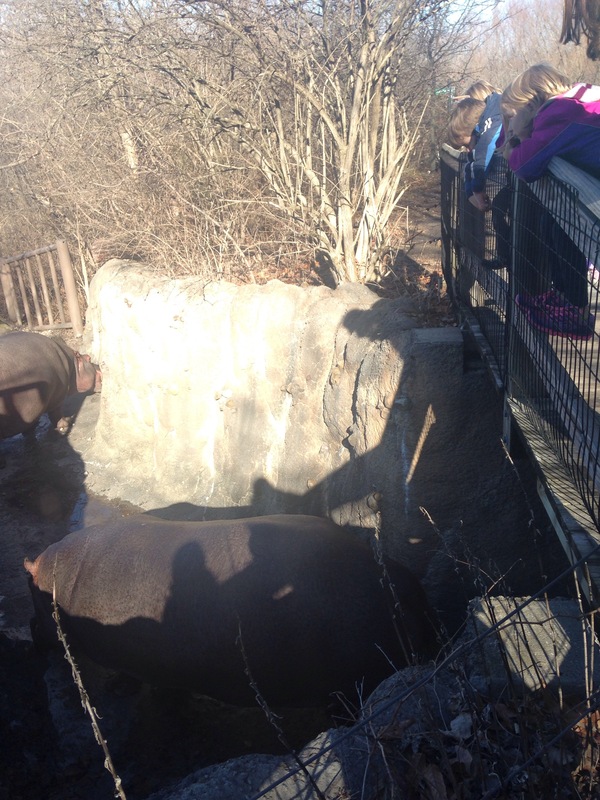 It was a beautiful day, but the zoo wasn’t very busy, so she even got to see many of the animals up close and personal. If you know me at all, you probably know I’m a planner. When I imagined how this year would go, I thought we’d have a schedule of when each subject was covered every day. Although I do like a good plan of what schoolwork needs to get done each day, I LOVE that we have the flexibility to spend time outdoors on nice days, visit friends just for fun, or even just take it easy if we need a lazy day or some extra snuggles. Turns out, my kids are teaching me important life lessons along the way. Who knew? One Saturday morning, while watching cartoons, C was muttering to herself, “3+3=6, 6+6=12, 12+12=24, 24+24=48.” DaddyMort thought he’d stump her and asked, “What’s 48+48?” A few moments later she said, “96!” to which DaddyMort just looked at her in surprise. DaddyMort has corrupted the children, which means we’ve been listening to Christmas music since before Thanksgiving. The kids have decided that their favorite Christmas CD is Duck the Halls: A Robertson Family Christmas, which is the family from Duck Dynasty. Their absolute favorite song is “Christmas Cookies” but they also love “Hairy Christmas” – which references a redneck Christmas – and “Duck the Halls” – which involves lots of quacking. It makes me laugh every time D asks to hear the redneck song. For some unknown reason, D has started getting out of his bed at all hours of the night. Some nights, it is literally 30 seconds after we leave the room when he comes out and says, “I can’t fall asleep.” Other nights its 3 AM and he silently crawls into our bed, hoping we won’t notice. Or sometimes it’s at 6:30 AM, shortly before he’s allowed to get up, stating that he’s lonely, despite the fact that he shares a room with his sister. On some of these nights, I end up climbing into his bed to snuggle him for a bit. And he’s so freaking adorable. He puts his arm around me and rubs my hair. After a couple minutes, he usually squirms around until he can plant a kiss on my cheek, then he goes back to rubbing my hair. 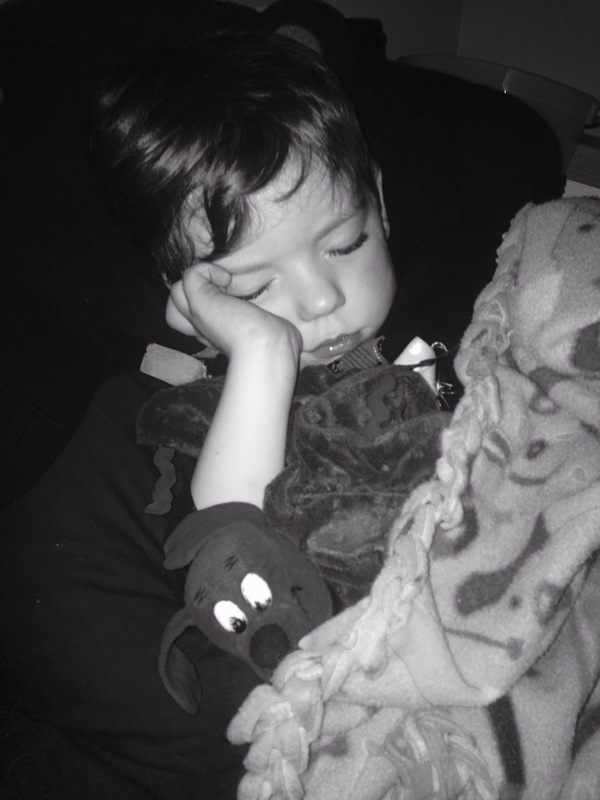 And when is he sleeping, could he be any cuter?!? While making lunch one day, I pulled out Cheetos, which are kind of a treat around here. C said, “I don’t want Cheetos. Do I have to eat them?” Uhhh, no you don’t. I’ll just eat your portion.